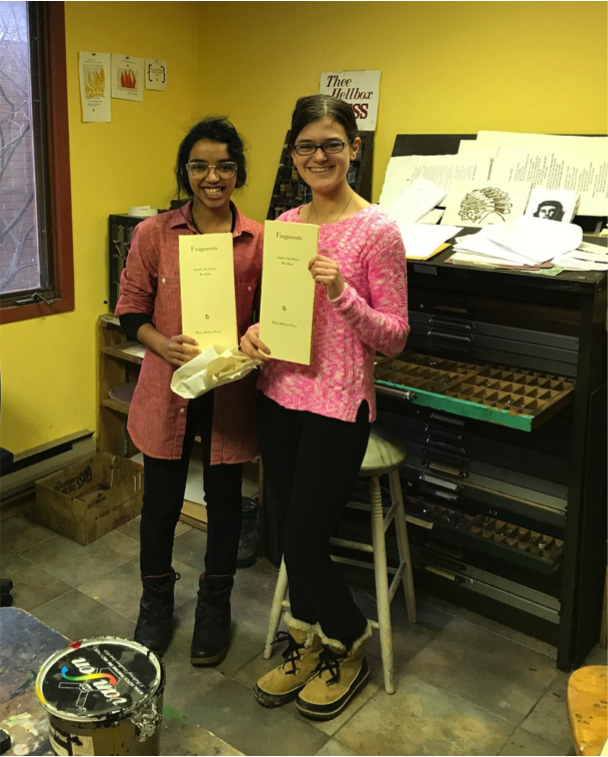 2017-18 Protégés Ria Raut (left) and Caitlin McAllister produce hand-printed copies of their work at Thee Hellbox Press, January 2018. With the generous support of corporate and community donors, Kingston WritersFest has once again offered a unique opportunity to the city young writers through the Merilyn Simonds Protégé Project. Two local high school students, Ria Raut (Kingston Collegiate and Vocational Institute) and Caitlin McAllister (Loyalist Collegiate and Vocational Institute) were selected by a jury of educators and authors to receive a four-month, one-on-one writing mentorship with a local professional author. Starting in late 2017 and continuing into spring 2018, Ria and Caitlin experimented with a range of genres, developed their writing skills, and expanded their knowledge of the literary and publishing worlds. Examples of their best work have been published on the Kingston WritersFest website, and they have participated in public reading events and radio interviews. The Protégé Project is intended for high-school students in grades 9 to 12 who demonstrate an enthusiasm and talent for writing. Special consideration is given to students who confront challenging circumstances in their personal or community lives that might limit their creative opportunities. In 2017-18, students from across the city were eligible to apply, as were those affiliated with Pathways to Education. Fostering a love of writing and reading among young people is one of Kingston WritersFest’s core objectives. This initiative complements a roster of Festival youth programs designed to nurture creative expression, enhance communications skills, and open the imagination to new worlds. The mentoring of young writers was a particular passion of the Festival’s founding artistic director, Merilyn Simonds, for whom the Project is named. The 2017-18 Project was supported by corporate donations, in-kind gifts, and individual donors under the administration of Kingston WritersFest staff and volunteers. Thank you to the mentors and to all who made this second Protégé Project term such a resounding success!